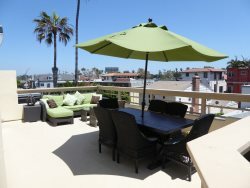 Perfect location, steps from the beach and a beautiful walk by the beach to Pacific Beach restaurants and nightlife. Belmont Park is in the backyard, tons of other things to do! You can’t put a price on the sunsets at this place. Great value for a lifetime of memories! The Sea Star was exactly what we wanted. Very comfortable, great beach views from inside or the balconies. Perfect for 8 people. Pacific Sunset Group was very helpful in providing the information we need for the Sea Star and for enjoying San Diego. We all enjoyed our stay and hope we get a chance to return to the Sea Star in the future. Thanks for all your help. Everything was perfect! We loved being so close to the beach. The unit was very clean and we'll furnished. Great location being so close to the shops and the beach. Unit was very private and quiet. The A/C worked very well. The outdoor shower was so convenient! Our best San Diego trip ever! My family loved the Sea Star! My husband and I, our two sons and their wives, and three grandchildren had a wonderful time in the property. It was just the right size and a great location just across the boardwalk from the beach. Our sons tried surfing, and the children loved playing in the surf and sand. There are so many restaurants within walking distance that we only got into the car for the trips to the zoo and Legoland. The decks are wonderful to relax on or for people-watching. All in all, a fabulous experience. Thank you so much. The Sea Star is a great place to stay. We walked every day to different locations from the Sea Star. It is located in a great area. The view of the beach and sunsets could not have been better. It is well maintained and very clean. We cooked most of our meals, because no one wanted to leave. The kitchen has everything you need to cook. We did want to grill steaks, but no outdoor grill. All the bedrooms are very comfortable. We have already made our reservations for next year at the Sea Star, we recommend it highly. Place is very nice and a great location. Steps from the beach, large deck upstairs can see the ocean. It was very clean and well stocked. Kids bunk beds downstairs and the outdoor shower were great. Worked well for Grandma, mom and dad, and 2 kids. We will be back! This condo was absolutely gorgeous! Beautiful and stylish decor throughout. The location is perfect and from the large top deck we enjoyed seeing a bit of the ocean and walking to the beach takes 2 min if that. We walked to several wonderful restaurants and Kojacks Greek food and Luigi's were a couple minute walk and we ordered takeout from them several times to take back to the condo and enjoy on the relaxing rooftop deck. There is decks off all 3 bedrooms and a large one with nice furniture and table off the living room. The king size bed was SO comfortable and I'm picky about beds! Lots of towels and beach toys too. Thanks so much for such a gorgeous place to stay, our family had an outstanding time and made lots of memories we will have always. The bungalow is Bayfront of Mission Bay, which is away from the public beach access of Mission Beach. The view is phenomenon, particularly at sunrise. The bungalow is tidy and I enjoyed the grill on the deck. First time I’ve ever booked a location and had no issues. Everything was perfect. Everything we needed in the home was there. The 2 car garage was a major plus. The set up of the home was top notch. Highly pleased with this rental. I would definitely book again. This is a great condo-clean, well stocked, comfortable & great location. Garage is a plus! We loved staying by Mission Bay. The rental was perfect for us. The bedroom had a comfy king size bed. We had two closets for storage. The bathroom shower was large. Keeping in mind the drought, we didn't take long showers, but the shower was inviting! We appreciated the washer/dryer, as we have been traveling down the coast for weeks. The living room was great for relaxing, and though we didn't need the fireplace in August, we loved the idea of it. The kitchen was just what we needed for quick breakfasts before big days. We didn't use the grill, oven or cooktop, but you could easily cook in this kitchen! We spent lots of time on the patio, which was even more amazing than the pictures show. The garage was great and easily fit our economy rental, a 5 door Hyundai Elantra hatchback It was so easy to get to the bay for a walk/swim. The beach is two blocks. There was a great Mexican takeout place around the corner on Mission Boulevard. It's a .25 mile walk to Belmont Park. We felt very at home here, and will definitely come back. Check in was a phone call. Easy! We felt well cared for by Cheryl. Thanks for great week! My husband and I loved our stay bayside in Mission Bay at Cheryl Ann's place! We were lucky enough that she was able to be flexible with our check in schedule as we were flying in early. Communication through airbnb and email was easy and efficient. The place was very clean and ready for us upon check in and had all the amenities you would need: grill, kitchen utensils, beach towels, etc. We are very familiar with the MB/PB area and were excited to have bikes to use to get around. The location is great for things to do and the main strip in PB/Garnet Ave is only 2 short miles away up the boardwalk! Downtown is only a short uber or lyft ride away as well. You can't beat the view from the huge upper patio and we enjoyed sitting and looking out onto the bay. The bed was big and very comfortable. The bay is so quiet and peaceful that we were even able to sleep with just the screen door shut to let the breeze through. We would definitely stay at Cheryl Ann's place again and would highly recommend it to couples coming to the Mission Beach area for a fun and relaxing vacation! Great place with all the amenities necessary for a wonderful week at the beach. Cheryl Ann was quick to respond with any questions we had and was very professional! Great location walking steps to beach, dining and entertainment! Perfect spot for both kids and adults. Would definitely stay again! The house was Amazing! When we arrived every room looked identical to the online pics. Pristine condition. I truly appreciated that it was stocked with necessary supplies so that we didn't have to run to the store immediately. The rooftop deck was my favorite, it had great furniture and gas grill. Great communication and attention to detail. Thank yo so much Cheryl Ann. The house exceeded expectations and made our trip feel like a home away from home. The place was an awesome location just steps from the beach - could even see a piece of the beach from the patio. Preferred this location over those right on the boardwalk due to added privacy. Unit was spotless when we arrived and had lots of kitchen tools for our use. Outdoor shower was also a plus when coming back from the beach. Garage was pretty tight as explained before arriving but always managed to get parked. Was some minor noise from the unit above. Would stay here again! This home was very clean. A stay on the Bay side is nice as it is quieter then the ocean side. We noticed that the outdoor patio on this unit is more elevated than other nearby homes which adds a bit more privacy from the people strolling along the Bayside Walk. Having garage and driveway space was key for us and there is space between the unit and the neighbor on one side which adds to the private feel. This location was perfect. We also enjoyed seeing the SeaWorld fireworks each night from the patio. An added unexpected perk! This home was perfect for our group of seven adults. Tat three of the four bedrooms had their own balcony was wonderful, because we all got to have any "personal" time without being shut up in a room. The location was perfect - far enough north of what appeared to be the more touristy section, so no big frat house parties on the beach in front of us. The kitchen contents were awesome! I had brought my emulsifier from home for a soup I was planning to make, but needn't have bothered since they had one!! The only suggestion I could make would be a chaise lounge or two, but honestly, that would be the cherry on top of the icing on the cake! Wonderful balcony! Great location! Wonderful view. Love the peace and serenity of bayside. Just a short walk to the action on the ocean side boardwalk. Happy to have the garage parking spot. Very clean, very comfortable. And just 110 steps to fantastic tacos at Sara's Mexican walk-up window. Great place to rent in San Diego. Being on the bay side was perfect for us with three little ones and it was still just a very short walk to Mission Beach. Very clean with nice amenities. Having a garage was a nice perk since parking in San Diego seems so limited. We easily got to every place we wanted to with ease from this location. Would definitely recommend staying here. This was such a nice home away from home! Probably the best beach rental we have ever had. The attention to small and large details is what made a great vacation memorable. Great location right on the bay away from the noise but only 2 blocks to the ocean and restaurants/shops. We were especially impressed by the little touches throughout the house, supplies, beach towels, extra blankets, bikes and sand chairs. I especially appreciated the fresh flowers, I am a floral designer and it was so great to have those simple beautiful wild flower arrangements in the house. And the group managing the property were helpful and very nice. Truly a memorable experience from start to finish. We will be back! Amazing location! Note the house is on the second and third floor, first floor is not included in rental but there is a side path to the beach and boardwalk. The house was spacious and nicely decorated. Kitchen was well stocked with cooking and baking utensils which was much appreciated. Master bedroom and balcony were nice and very spacious. Second and third bedroom upstairs that share a jack and Jill bathroom are a decent size but the bathroom was a little small and not updated. Living room, kitchen, dining area and balcony off living room were great, very spacious with lots of seating. The fourth bedroom downstairs along with the bathroom were both a nice size but note the balcony is tiny! Carpet on stairwell was a little dirty and some damaged flooring in the kitchen had been covered up with the rug. We had issues with the Wi-Fi the first two days along with the cable but the host were extremely responsive every time we had to contact them. The house included a washer and dryer which was very nice as well as a two car garage but note it's a tight fit with two cars. Belmont Park with lots of eateries is .9 miles away and easy walk along the boardwalk. We really enjoyed our stay and would definitely consider booking again. This was one of the best vacations I've ever had. The house was nearly perfect. The only suggestion I have is to make the lights easier to navigate (labels?). But if that's the only thing to whine about, it must be a pretty great place! We had a great stay! The location is perfect - easy drive to attractions. But, it's nice to come back to a quiet "home" after a long day. Beach access is close - my girls LOVED the sand toys. And I appreciated having beach towels provided for us! Also, thank you for being so responsive to all our questions. Great stay! Excellent location to all the attractions and theme parks we went to, awesome deck to enjoy the view and have a meal, and so nice to have a garage to park the car in! The kitchen was well equipped with everything we needed the couple times we decided to stay in and cook! My 3 year old loved the deck to hang out and play! We had the small cleaning issue the first day, but Denise was fabulous and took care of it promptly! Thank you so much! We loved our stay! The unit was very comfortable and clean, we loved the deck and the view! We felt so relaxed and enjoyed every minute of it. Thank you for helping to make our family vacation so special! Our stay over the Labor Day weekend was excellent. The Sea Star was perfect for our family and we would definitely recommend it to others who are interested in a vacation to San Diego (Mission Beach). The Sea Star is in a really great location with tons of options for things to do!